The tsunami was preceded by a potent volcanic blast that may have triggered it. 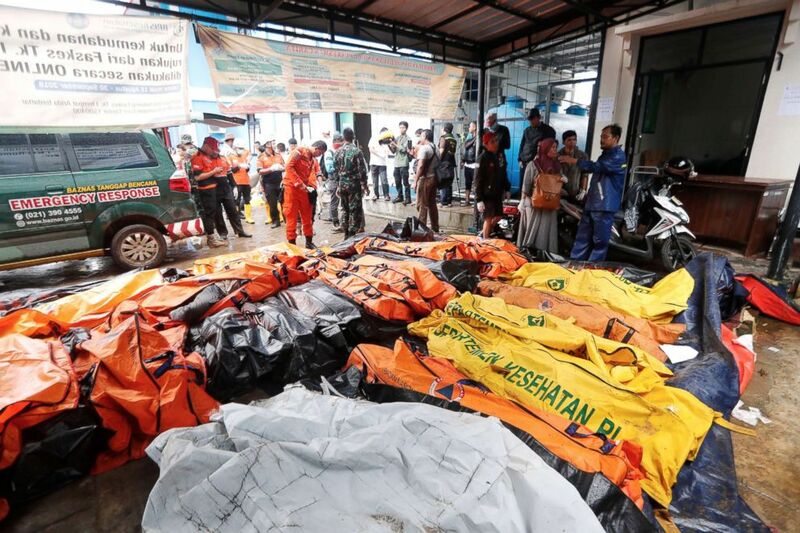 Scores of people were killed and many more were injured or unaccounted for when a tsunami hit the island nation of Indonesia without warning Sunday following a volcanic eruption and underwater landslides miles offshore. 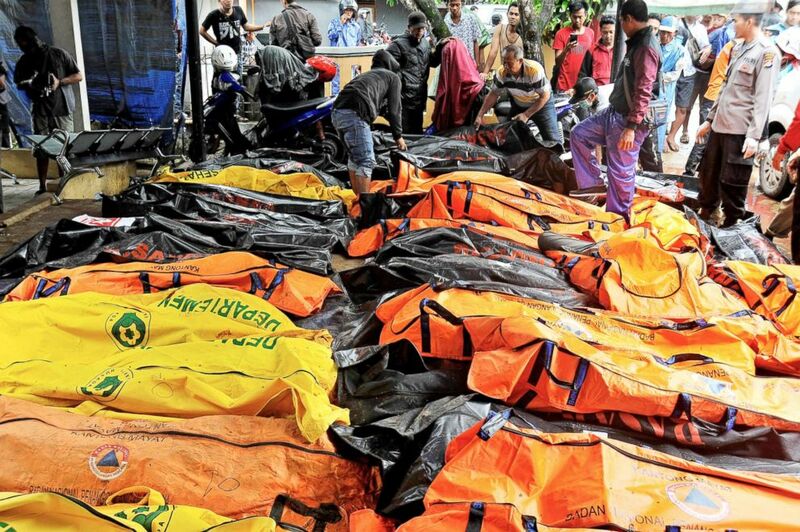 At least 429 people died, more than 1,400 were injured and another 158 are missing as of Tuesday morning, more than two days after the wave came crashing ashore on the northwest coast of Java, one of the large islands comprising the country, officials said. 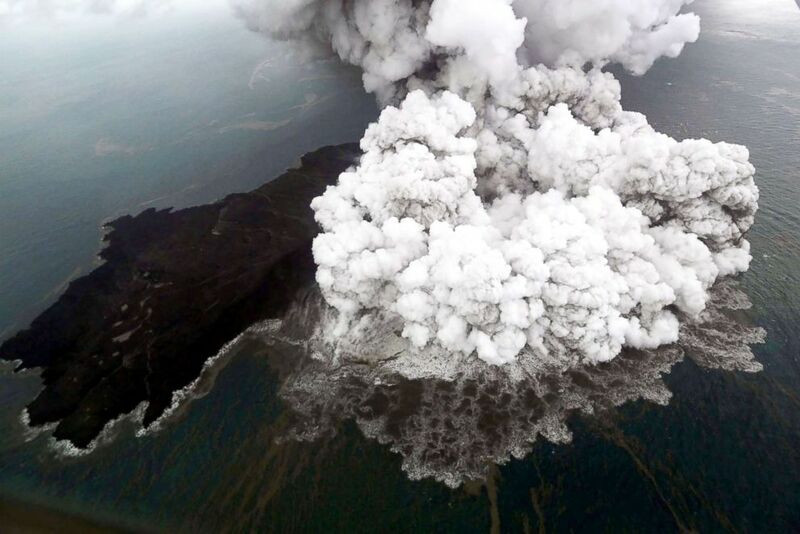 The threat did not disappear with the waves themselves, as officials were warning residents and tourists to stay as far away from coastal areas as possible on Monday because continued volcanic eruptions from Mount Anak Krakatau could potentially trigger a second devastating tsunami. More than 600 housing units and at least nine hotels were destroyed or badly damaged in the tsunami, according to Sutopo Purwo Nugroho, head of public relations for the Indonesian National Disaster Mitigation Agency. He said more than 16,000 people have been displaced. (Fauzy Chaniago/AP) A man reacts after identifying his relative among the bodies of tsunami victims in Carita, Indonesia, Dec. 23, 2018. 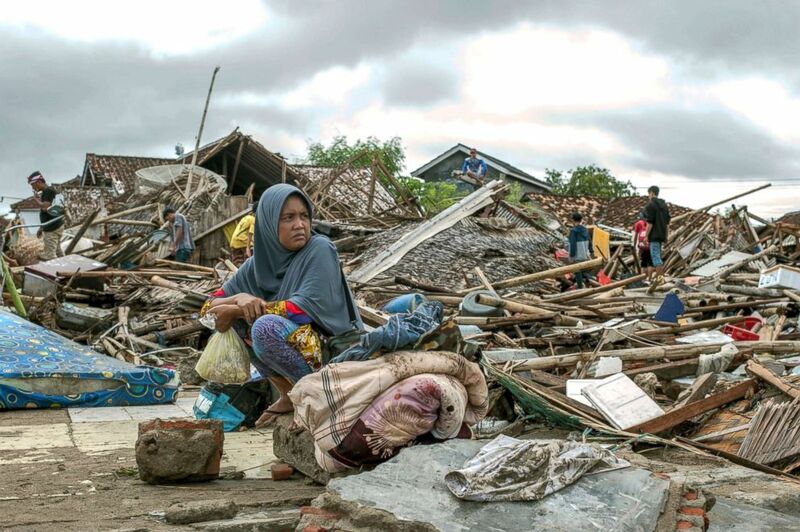 Nugroho said at least 430 houses and nine hotels were destroyed or badly damaged in the tsunami. 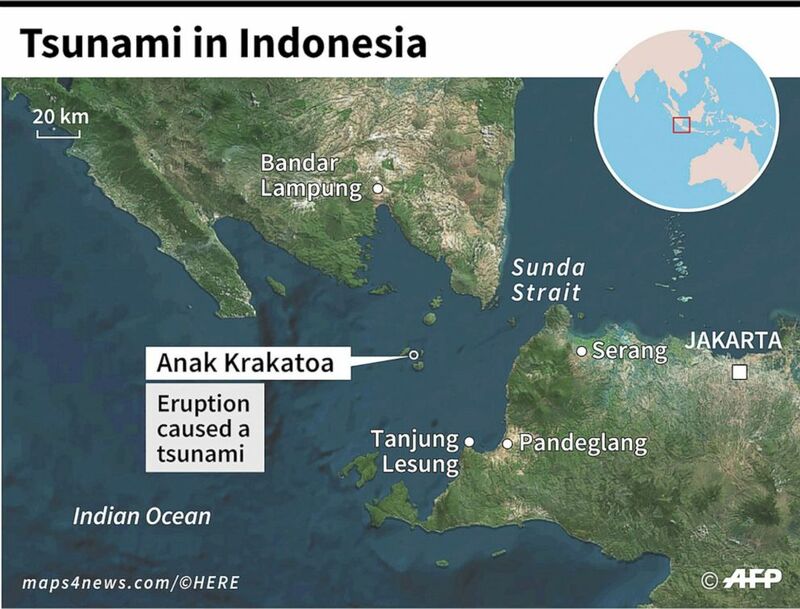 The tsunami was likely caused by underwater landslides that came on the back of the eruption of the Anak Krakatau volcano in the Sunda Strait, about 60 miles off the coast of Java, Indonesia's Meteorological, Climatological and Geological Agency said. The tsunami struck 24 minutes after the volcanic eruption. The devastation may have been exacerbated by an inoperable tsunami early warning system, which, due to a lack of funding, vandalism and technical problems, hasn’t been operational since 2012, Sutopo said. It was Indonesia’s second tsunami this year, and it struck in a flash, officials said. A tsunami that struck the island of Sulawesi in September briefly was preceded by a potent earthquake on land that caused the ground to shake but gave the coastal population precious extra minutes to head inland. On Saturday night, the tsunami blasted the shoreline without warning, sucking beachgoers into the raging sea with the overwhelming force of a giant magnet. (Antara Foto/Bisnis Indonesia/Nurul Hidayat via Reuters) An aerial view is captured of Anak Krakatau volcano during an eruption at Sunda strait in South Lampung, Indonesia, in this photo taken by Antara Foto, Dec. 23, 2018. The Krakatau volcano is part of the sprawling, horseshoe-shaped natural disaster zone dubbed the "Ring of Fire". The zone stretches 25,000 miles from New Zealand up through Indonesia, the Philippines and Japan, and then across the Aleutian Islands and down the coasts of Alaska, Canada, the West Coast of the United States and all the way down to the tip of South America. In one dramatic scene caught on video, the Indonesian pop band "Seventeen" was on stage performing at the Tanjung Lesung beach resort near the tip of Java when a wave of water plowed into the stage and washed the band members into the audience. (Veri Sanovri/Xinhua via Newscom) Locals clean debris at Sumur district of Pandeglang, Banten Province, in Indonesia, Dec. 24, 2018. 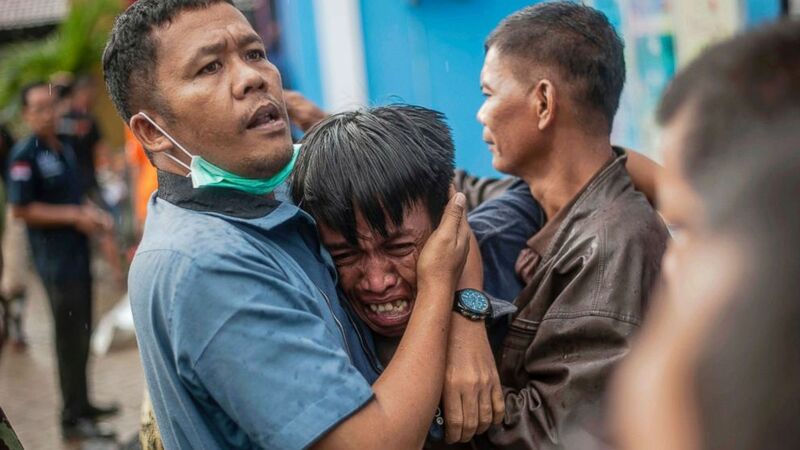 In an emotional video posted on Instagram in the aftermath of the tsunami, Riefian Fajarsyah, the lead singer of "Seventeen," said the band's bass player and manager were killed. He said the group's lead guitar player, drummer and a crew member were missing. Fajarsyah said his wife was also missing. "Please pray so that my wife Dylan [Dylan Sahara] will be found soon," said Frajarsyah, sobbing. President Donald Trump tweeted about the disaster, calling it "unthinkable devastation." "More than two hundred dead and nearly a thousand injured or unaccounted for. We are praying for recovery and healing. America is with you!" Trump tweeted. 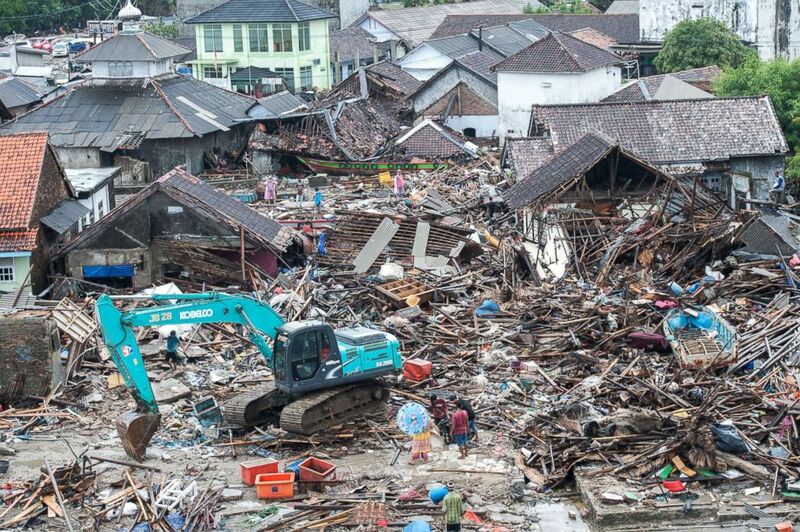 Unthinkable devastation from the tsunami disaster in Indonesia. More than two hundred dead and nearly a thousand injured or unaccounted for. We are praying for recovery and healing. America is with you! Speaking to a gathering of pilgrims at the St. Peter's Square at the Vatican, Pope Francis asked the world to pray for the victims of the Indonesian catastrophe. "My appeal is that these brothers and sisters may not lack our solidarity and the support of the international community," the pope said. (AFP/Newscom) Map locating the Anak Krakatoa volcano and the zone hit by a tsunami in Indonesia. Pandeglang, Serang and South Lampung on the island of Java were the hardest-hit regions, according to authorities. The regions are a few hours west of the capital city of Jakarta with its population of almost 10 million people. The most affected area was the Pandeglang region of Banten province in Java, which includes Ujung Kulon National Park and surrounding popular beaches. Video footage from the disaster zones showed hundreds of homes in ruins and vehicles that had been tossed about like toys dotting the wreckage. (Antara Foto/Ardiansyah via Reuters) Residents, who lived at coast of Bandar Lampung, rest at a government building after they evacuated following a tsunami that hit Sunda strait in Lampung, Indonesia, in this Dec. 24, 2018, photo. 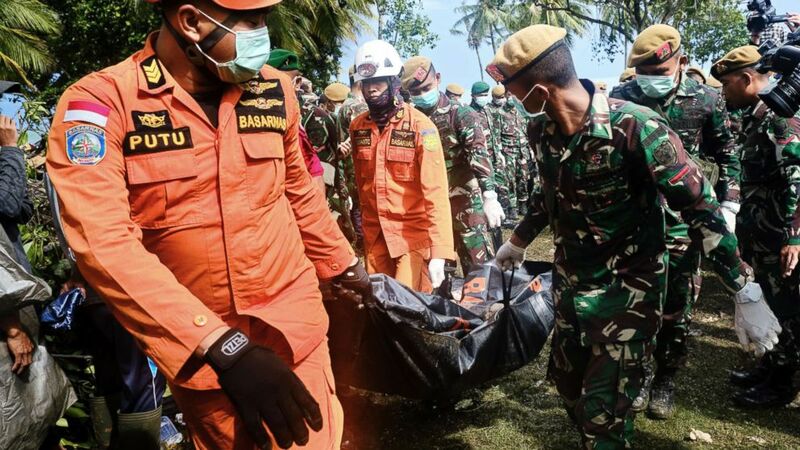 A team of police officers combing collapsed buildings in a village north of Labuham on the northwest coast of Java island saved a 5-year-old boy found buried in the rubble. A video showed officers pulling the boy from a collapsed structure and carrying him to safety as he broke into tears. Kathy Mueller of the International Federation of Red Cross and Red Crescent Societies told ABC News that her organization mobilized teams to help in the search-and-rescue effort and to treat and help those saved. (Ed Wray/Getty Images) Rescue workers recover the body of a victim of the tsunami during a search at a resort hotel on in Tanjung Lesung, Indonesia, Dec. 24, 2018. "Their priority is to make sure that those who survived this tsunami are looked after as well as to make sure that if there is anyone at all trapped in the rubble, that they are rescued and brought to safety," Mueller said. She said the rescue effort was being hampered by damage to main roads leading to and from the hardest hit areas. (Antara Foto/Asep Fathulrahman via Reuters) Bodies of tsunami victims are collected at a local health facility after a tsunami hit Carita in Pandeglang, Banten province, Indonesia, Dec. 23, 2018. "And, of course, it's also the rainy season so people whose homes have been destroyed or damaged, they may not have structures to sleep in tonight so ... we're bringing in things like tarpaulins to help provide at least some makeshift shelter," said Muller, adding that this is the third major natural disaster to hit Indonesia since late July. She said many of those being treated in hospitals suffered cuts and scrapes. (Jorge Silva/Reuters) A man reacts after identifying a relative during a rescue operation at the beach front hotel, which was hit by a tsunami in Pandeglang, Banten province, Indonesia, Dec. 24, 2018. 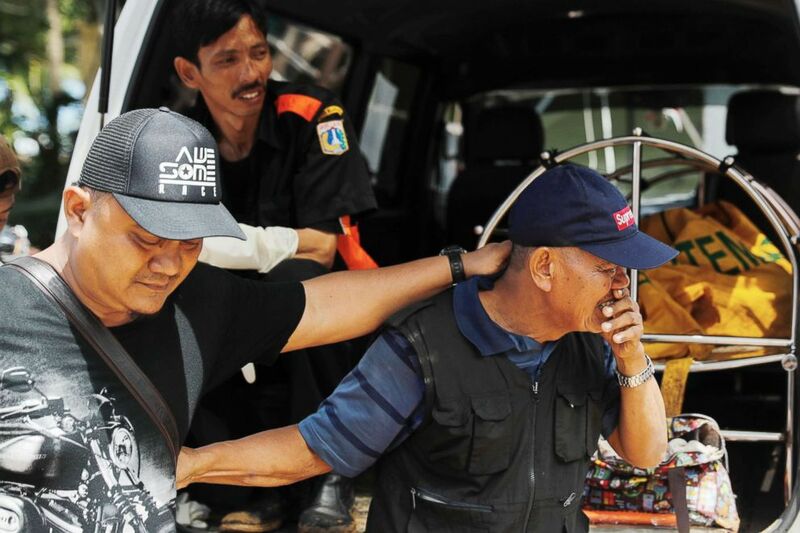 "I want to express my deep sorrow for the victims in Serang, Pandeglang and Banten Province," Indonesian President Joko Widodo said in a statement translated from Indonesian, according to The Associated Press. "May those who are left be patient." (Fauzy Chaniago/AP) A tsunami survivor sits on a piece of debris as she salvages items from the location of her house in Sumur, Indonesia, Dec. 24, 2018. Krakatau, a volcano located between the islands of Java and Sumatra, is known for the historic eruption in 1883 that blew the island apart and killed 30,000 people. It has erupted regularly since. Prior to Saturday, Anak Krakatau erupted on Oct. 15. (Adi Weda/EPA via Shutterstock) The bodies of tsunami victims are collected at a health facility after a tsunami hit the Sunda Strait in Pandeglang, Banten, Indonesia, Dec. 23, 2018. Indonesia was struck by a massive earthquake and tsunami in late September. The disaster hit Sulawesi, an island hundreds of miles northeast of Java. The disaster killed over 2,000 people and displaced 70,000 more. ABC News' Maureen Jeyasooriar, Mark Osborne and Chris Francescani contributed to this report.